If you’ve never tried (assuming you play guitar) you may not realize how difficult, even counter-intuitive it can be to play “completely free” on the guitar. Part of it is percussiveness, gravity, the way that hands situate to the keyboard versus a fretboard-and-finger action that is not a first reaction-inclination if you are say three years old and somehow get next to a guitar. And in some ways it explains why we might find more absolutely freestyle pianists than guitarists? A child may sit down to a piano and wang away at it without a whole lot of thought. Because it is a percussing. Plucking is less obvious. On a guitar really you must already know how to play it pretty well or very well before you can hope to address a potentially valid “free” and completely open improvisation. That does not mean an excellent free improvisation on the piano is something easy. It is not at all easy. If we lost a titan of the free improv piano around a year ago, that is the giant Cecil Taylor, we are in many ways still reeling from the loss, for he was one-of-a-kind, not someone you replace so much as keep in memory and pose as a model for such things regardless of the instrument. He was brilliant and so far beyond a merely intuitive stance as to be in the same select league as all exceptionally great players of instruments in human history. 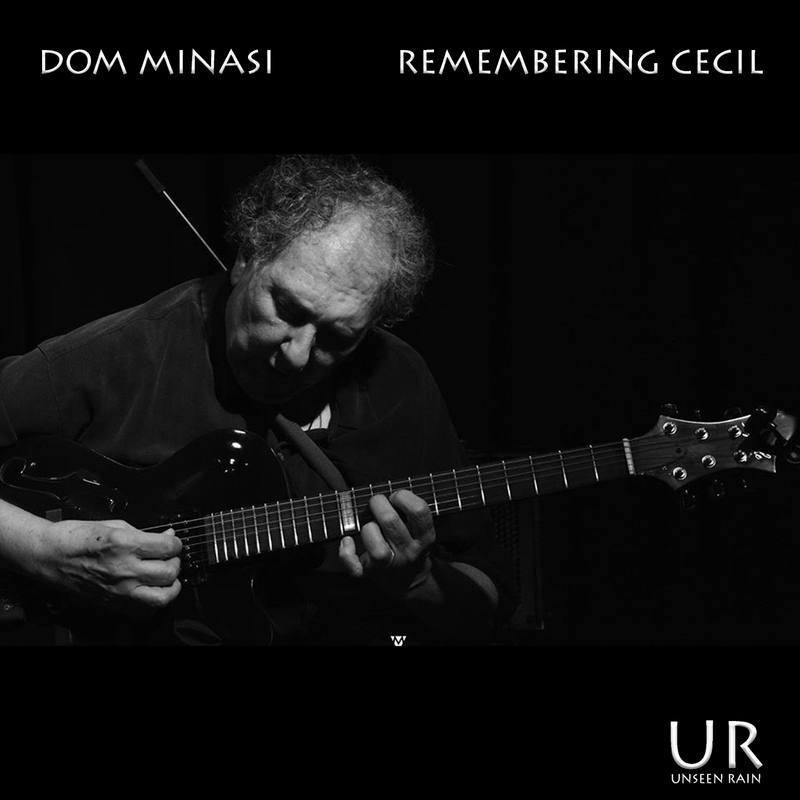 Given all that guitarist Dom Minasi, someone readers of this column I hope know of and appreciate as one of the living lights of the guitar today, aimed recently to pay tribute to the master free improviser pianist in a full set of solo electric guitar entitled Remembering Cecil (Unseen Rain UR9912). The album is the ultimate challenge of artistry at its most exposed. Just Dom, his guitar and the recording apparatus. He gives us four free improvs that as Dom notes in the liners, are a culmination of his 30 years of playing freely and so too of appreciating the music of Cecil Taylor. What most intrigues me in listening long and carefully to Dom is the reality that he sounds like no other guitarist when he plays, both in a more straight-ahead mode as well as freely, and that he is a very original free guitarist with a style all his own. As he mentions in the liners this is not “atonal” music but it is not pre-planned nor is it in any set time frame. It cascades. It tumbles. It makes use of all the guitar technique, the considerable guitar technique and schooling Dom has gained and maintained over a lifetime of playing. The technique Dom has accumulated is put to use in a very personal way, in other words, and that is what makes his identity strong and thoroughgoing. The improvs perforce do not sound at first blush identifiably like Taylor’s playing, but that in many ways is because the guitar has its own challenges and playing free on the instrument means a different set of possibilities. And so there is a underlying closeness between the two players in intent, but not in the ultimate sound. In the end as a free guitarist he sounds completely like himself–not like Derek Bailey, not like Sonny Sharrock, not Elliot Sharp. Like Dom Minasi. In the course of this album you hear the artist just as he was recording this in real time, a kind of self-portrait that is also necessarily a kind of portrait of Cecil Taylor. And in the process we find on close listening one of the gem examples of free guitar art. And so there you go. Bill Von Zangenberg :Your free form playing is pure genius. Alberto Gutiérrez Jazzóologo “Excelente maestro”!!! Jack DeSalvo:” The guitar playing is genius. ….And in this world of free improvisation no other guitarist, including Derek Bailey, has reached this advanced point”. Susan Alcorn:“ Earth, wind, water and sky. Emotion, fire, lyricism. Tenderness. 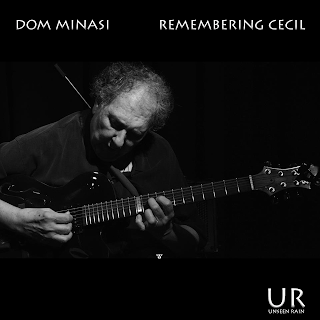 Dom Minasi has given the world a recording that beautifully captures the nuances and the spirit of Cecil Taylor in a loving tribute that will be cherished by future generations long after we, all of us, have ceased to inhabit this earth”. Dan Arcamone : “Dom, you’ve masterfully captured the spirit of Cecil Taylor’s music. The feeling, the motion, the motivic contours, and unrelenting stream of ideas on Remembering Cecil make this a powerful tribute. It’s a beautiful recording’. Jay Rosen: “Congrats Dom for encompassing the spirit of Cecil Taylor on the guitar”. Tomas Ulrich: “Another exceptional musical offering from one of New York’s unsung musical masters”. David Juarez:” I love the intensity of the album, the personality and rawness, the way that tension is created and resolved is not predictable and staged which makes it obligatory to anyone who is looking for limitless creativity in music”. Daniel Stearns: “This is the man to interpret the late pianist’s sorcery. Dom is a visionary composer who has at last brought free-jazz into the Orchestral fray”. far -fetched, but Minasi does a marvelous job of it. The album consists of four extended free improvisations, an approach akin to Taylor’s often very extended solo piano workouts. Taylor’s music was commonly described as atonal. It wasn’t always. Not even most of the time. It was very often very percussive—Taylor played the piano at times as if he were trying to hammer it into the floor. 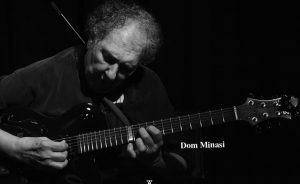 Minasi, through a free-leaning player, presents a much smoother flow, with chord clusters and rapid-fire single notes coalescing into an odd and angular allure, a sound that is more overtly beautiful than what Taylor played—not that beauty wasn’t there with Taylor, but sometimes multiple deep listening was required to fully appreciate it. Minasi could probably play improvisations like this in a winery tasting room—where understated background grooves are usually heard—without getting tossed out of the place, though a segment of the audience (those not in the know; those without curious ears) might roll their eyes, might think him crazy. And he certainly would not fade into the background; he would command attention. The spirit of Cecil Taylor, the headlong freedom, the chance-taking, the manic joy and live wire energy are all here. Dom Minasi does Cecil Taylor proud. Minasi’s beautiful ballad “Angela” (which he has recorded before) opens the set, and shows both players in lyrical form. This track would be right at home on a mainstream bebop guitar album, complete with sparkling harp harmonics at the end. His “Blues, Blues, Blues” delivers what the title promises (albeit with a distinctly Monkish flavor), but it also has edgy moments well outside the traditional blues box, especially a wild, dissonant duet section. Two brief improvisations occupy the center point of the album. After a rubato opening, the first develops into an intense rhythmic romp. The second is much more reflective, and concludes with more of those lovely harmonic arpeggios. Minasi’s “Inside Out” is another memorable ballad (which recalls the Thelonious Monk standard “‘Round Midnight”), and it elicits more expressive melodic invention from both players. Juarez makes his sole compositional contribution with “Tritonal Ballad,” a piece heavy on the tritones and light on ballad feeling. It has a distinctive harmonic signature, more “out” than the straight jazz tunes but less harmonically unpredictable than the freer playing. There were numerous Monk references throughout the session, but the finale finally gets to the real thing: a gleeful romp through “Well, You Needn’t,” with the players egging each other on to further and further extensions of the original harmony. Contemporary jazz guitar playing doesn’t get much better than this. An easy recommendation to guitar fans who like their bebop with a bit of spice. April 5th is the anniversary of Cecil Taylor’s death. I have a new album that is being released on BandCamp first and later on this month worldly release of the full package with liner notes etc. If you would like a link to the Bandcamp download, please let me know.